Our 17 lane range is newly constructed, brightly lit, and well ventilated. Our air conditioning always runs at 71 degrees and its high-volume. HEPA air filtration system uses the same technology as hospital operating rooms to remove 99.97% of airborne particulates. This means that our filters take in lead and unburnt gunpowder, not you and your families' lungs. We have a huge selection of handguns and rifles to rent and over 15,000 guns in stock for sale in the main store. Our friendly and knowledgeable staff will do everything possible to ensure that you have a safe and enjoyable shooting experience. $14.99 per handgun lane and the first shooter. $14.99 per long-gun lane and the first shooter. $5.00 per additional shooter with a maximum of three shooters per lane. Our lanes are 25 yards long. 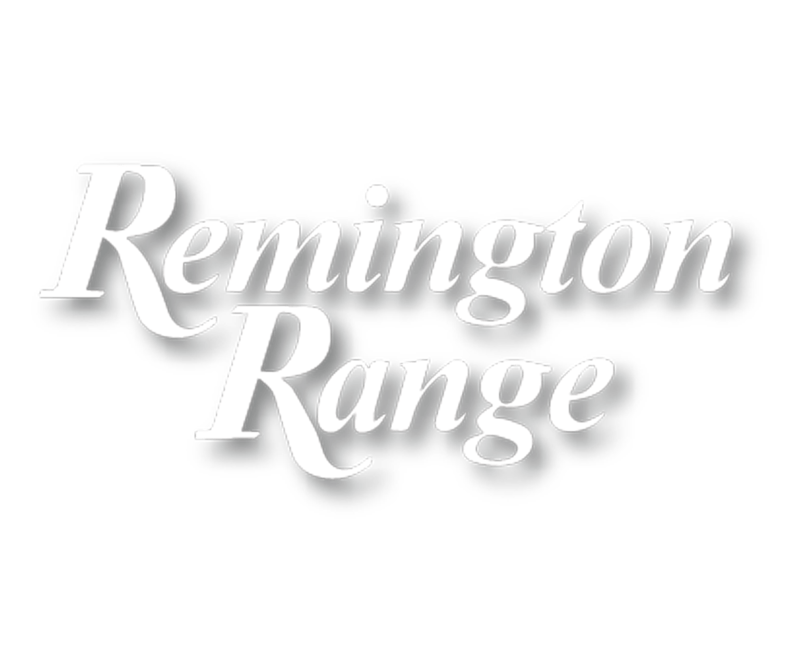 Over 300 firearms available to rent in the range. $30 per machine-gun rental (must be 21 to rent). Only ammunition from Adventure Outdoors may be used in our rental guns. Be a member (for at least 2 weeks). Be in a group of two or more. Or have your firearm with you. 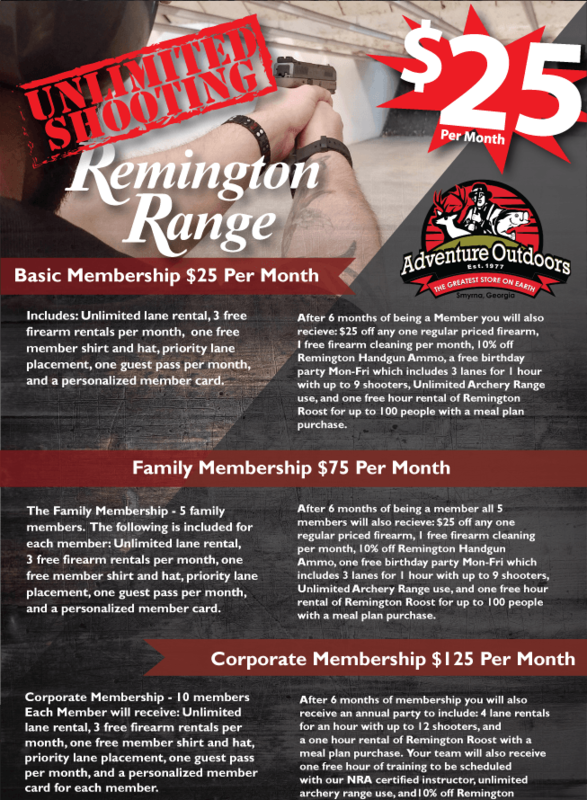 $299.99 per individual membership for 1 year of unlimited shooting. 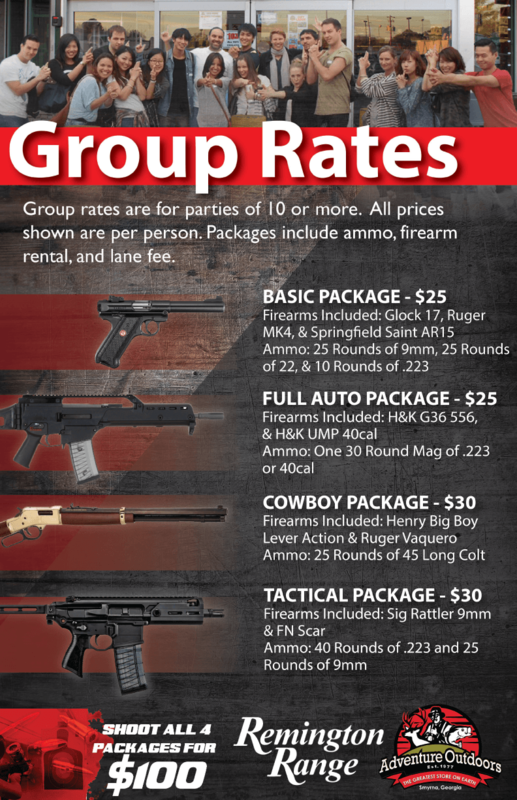 $799.99 per individual membership for 3 years of unlimited shooting. 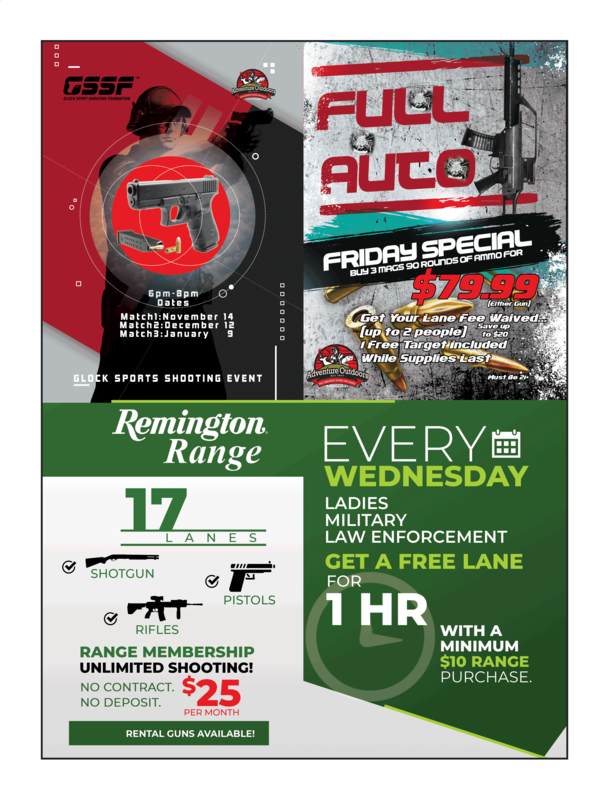 All memberships also include a $25 gift credit towards the purchase of a new gun. $25 monthly subscription based membership available. You must be at least 21 years old to rent or shoot a handgun. You must be at least 21 years old to rent or shoot automatic firearms. You must be at least 18 years old to rent or shoot a long gun. If you are between the ages of 10 and 17, you may shoot handguns or long guns, but you must be under the direct supervision of a parent, or legal guardian. You may shoot your Class III NFA items on our range at our discretion. However, you must have a copy of you tax stamp present and all NFA items must be declared to range personnel. No excessively loose clothing or jewelry. Hearing and eye protection is required on the range at all times. We do not rent these items for sanitary reasons, but you may bring your own or purchase them in our store. Remington Range Rules and Regulations are posted in the range. Members and Guests, thank you for your support.